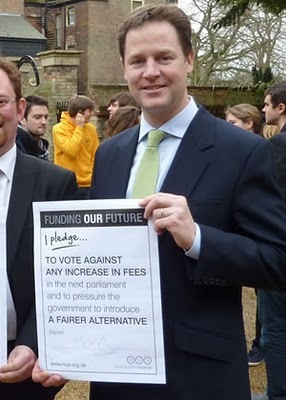 Nick Clegg's pledge to do exactly the opposite of what he's now doing. Tomorrow, Thursday 9 December, the Commons vote on higher-education tuition fees is to be held. A substantial number of Lib Dem MPs, as well as some Tories, are expected to revolt against their leadership and vote against the government or abstain. However, the revolt will probably not stop the bill going through, paving the way for universities and colleges to hike up tuition fees. Nick Clegg is under particular pressure after making a public, personal pledge to vote against raising tuition fees before the general election. Although his defence has been that a party can only sufficiently carry out its manifesto if it is the sole party of government, this misses the point that the pledge was given personally and absolutely. He also claims that the coalition agreement supersedes the pledge, but the absolute wording of the pledge — to vote against any raise in tuition fees — would make it disingenuous to enter into an agreement that would likely prohibit him and others from fulfilling their pledges. Either the pledge should not have been made or the the coalition agreement should not have been made as is. Finally, in an election broadcast, Nick Clegg, filmed on and around Westminster Bridge and surrounded by a litter of white sheets of paper, railed against the broken promises of New Labour and the Tories. Fair enough, hand up, but the first ‘broken promise’ shown is ‘No Tuition Fees’. This film now stands testament of the gross and absolute hypocrisy of Nick Clegg and the Lib Dems: if you’re going to campaign against broken promises, you have to realise that such a stand means that there is a greater moral imperative that you don’t break your promises. In addition, many who voted Lib Dem did so on the basis of such promises, and such clear cut cases of broken mandates will make the yellow party, which still lost seats in the last election, electorally marginalised. Categories: politics, society | Tags: broken promise, broken promises, coalition agreement, Higher education, hypocrisy, hypocrite, Lib Dem, Liberal Democrat, Liberal Democrats, Nick Clegg, promise, promises, Tories, Tory, Tuition, tuition fees | Permalink. The Liberal Democrats are doing most of the talking on this week’s budget, in an apparent attempt to convince themselves about it. My MP, Vince Cable, has been writing in the local rag about how we all knew that a tough budget was needed, that it will hurt, but is totally necessary. It is clear from various media vox pops that a number of people are being taken in by this ‘tough but fair’ line. The only thing that is obvious is that there is a deficit in government finances. The threat that is wafted before us is that of Greece, but the UK’s credit rating is in a far better state than that of Greece. And the assumption is that the markets trump all other needs in our society. This is a deeply offensive attitude towards the people of this country, and demonstrates the hateful ideology behind this budget. Vince Cable has been all over the TV trying to drum up support for this budget. However, when all its viciousness against families, disabled people, those on housing benefit and anyone who buys anything is listed, he defended the budget by pointing out the positives: all for business. So, the Con Dems are not only putting markets before people, but also business before people. They may retort that helping business creates jobs, and reduces unemployment, and thus is better for the general population. However, we have plenty of evidence that helping business mostly benefits upper management, and there is no ‘trickle down’. Categories: economics, politics | Tags: banking, banks, Buckingham Palace, budget, business, Civil List, credit rating, cuts, disabled, families, governement, housing benefit, income tax, Lib Dems, Liberal Democrats, market, monarchy, poor, progressive, regressive, rich, Robin Hood Tax, tax, taxation, trickle down, VAT, Vince Cable | Permalink. Today, the new Chancellor of the Exchequer, George Osborne, announced his budget. Variously named an emergency budget or an austerity budget, it is clearly more a slasher horror. We already knew that the Tories were going to be savage with the public purse, but we are beginning to see a Liberal Democrat Party beholden to a liberal economic theory, and the sidelining of that party’s social democratic wing in the name of coalition government. 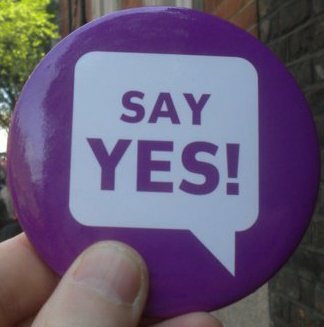 As everyone predicted, the new budget is a screw-the-poor budget: child benefit frozen for three years (huge impact on low-income families), housing benefit capped (those on low incomes will be forced out of some areas), SureStart maternity grant limited to first child (affects most families), tests for disability allowance to get tougher (fairly degrading to many claimants, costs to administer and will likely find fewer ‘bogus’ claimants than the Daily Mail expects) and VAT to increase to 20% (massively affecting the spending power of the poorest in society). Categories: economics, politics | Tags: air traffic control, banks, benefits, borrowing, budget, Chancellor of the Exchequer, Chief Secretary to the Treasury, child benefit, children, Danny Alexander, disability allowance, families, free market, George Osborne, housing benefit, income, infrastructure, Lib Dems, Liberal Democrats, maternity, poor, rich, Royal Mail, spending, SureStart, tax, taxes, Tories, trickle down, VAT | Permalink.